Mara’s question to me was the key moment that I recall from my visit to Valletta. That question is the centre of this story because it really was as if our lives – however briefly – had been thrown into a video game, its plot soaked in adventure, discovery and peril. All of this unfolded because of one simple decision: Do we turn back? Or do we carry on? Any gamer who plays the odd RPG can tell you that one simple decision can throw you completely off course from your desired destination. Maybe you see a cave and assume there’ll be some loot that you just have to find, or a path that you think might be a short-cut, and then – 20 minutes later – you’re on the other side of the map from where you should be. 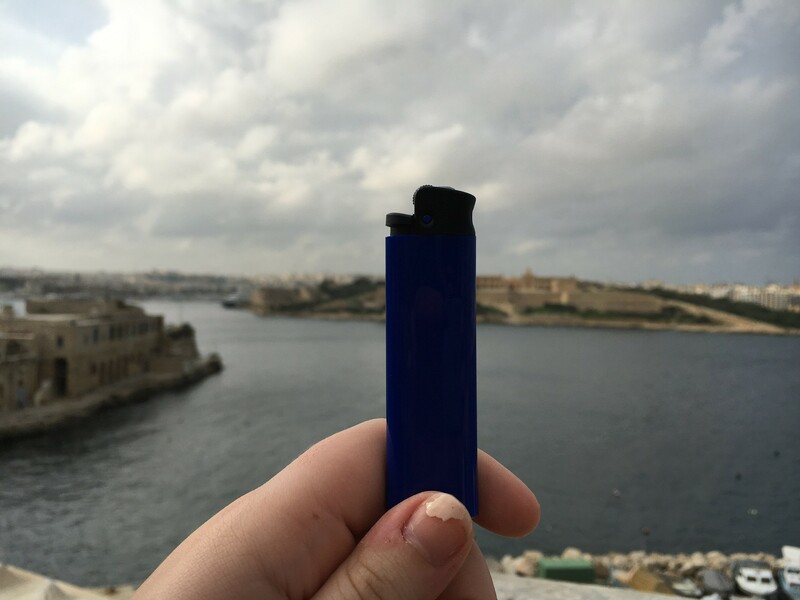 Our travels in Valletta were kind of like that. A two-hour bus journey from our place of residence led us into the centre of this beautiful medieval city. The glistening Christmas decorations hanging above our heads reminded me that it was late November, and not the middle of summer, as native Christmas shoppers darted around, dressed in coats and scarves, while we were slowly being baked in the humid 20-degree heat. Full of excitement – and a little sweaty – we embarked on a simple mission: To find food. Not a difficult task when every other door led to some kind of eatery, but we didn’t want just any old restaurant, we wanted something special. A left turn with a few cautiously navigated, narrow alleyways, led us down to the harbour and standing outside a beautiful seafood restaurant that, putting it mildly, was somewhat above our price range. Clearly, we were not a high-enough level to enter this part of the map. Although we couldn’t see any other foody-looking buildings around us, we assumed that another would be just around the corner, as was the case in the rest of the city. So we confidently and somewhat naively followed the harbour until we were the only signs of life for as far as the eye could see. After a good half-hour of trekking, the concrete path slowly became less of a flat and stable footway and more of a ragged cove. The debate to turn back occurred when we found that our route around the city was flooded, but as we’re not the types to be deterred so easily, we found ourselves clambering over steep, slippery rocks in order to avoid the large puddle. I seem to remember saying something along the lines of ‘If I knew we were going mountain climbing, I wouldn’t have worn flip-flops’ as we leapt and bound over the stones to carry onwards with our journey, adamant that we would once again find civilisation and a chance at a well-earned, hearty meal. I remember feeling gloriously free as we stood astride the rock-lined shore, the sea breeze brutally tangling my hair as it beat against my flushed skin. We were completely lost with no clue where to go and yet, I felt completely at peace… and a little hungry. A brief encounter with some equally disorientated tourists brought us to our biggest task of the day, the ‘boss battle’, if you will. Here was the life-affirming moment that comes from choosing to tackle a challenge head-on, or risk being defeated. And that day of all days, we were not going to be defeated. The only way to get back into the city meant climbing stairs that were only wide enough to fit a small dog, while being balanced over a large cove with angry waves lashing the rocks below. The stairs were crudely built into the rock-face, with no railing of any kind to keep us from tumbling down to meet our soggy, sorry end. But we had come so far, and to let this final leg of the journey beat us was simply out of the question. With determination, a hell of a lot of balancing, and repeatedly whispering the phrase ‘don’t look down’, we arrived at the end of our little sea-side adventure, and back into the safe and welcoming arms of the city. We finally found ourselves a nice little restaurant and felt an amazing sense of accomplishment as we wolfed down our meals and drank (far too much) wine. Our mission was complete, our reward reaped and our wonderful time in Valletta drew to a close. There was so much more that happened in the short time that we spent in this wonderful city, but to me, this adventure was the best part. I look back on this memory and remind myself that life is too serious to be taken seriously; life is a game, find the adventures where you can.